I know I've posted on boxers before, but I wanted to show you why I simply LOVE these boxers. There is no seam line down the center back!! That means NO RIDE!!! These are the most comfortable boxers, and whoever gets them always wants more! Plus, there are smaller sizes, so kids can have boxers just like daddy. 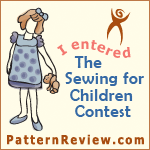 The pattern is First Choice Boxers for Kids and First Choice Boxers. I've never seen that pattern. Thanks for sharing. I took a class on this at a local quilt shop and have loved it ever since. Thanks for stopping by Shirley! Is that an easy pattern to sew? I love the Spongebob fabric! Yes Kim it is very easy. If you get it and have questions, let me know.